The intelligent hotel lock system is specially designed to meet the needs of modern hotels, maximum security, individual style and low operation costs. Lock hardware is made of cast steel, to create impact resistant ability. 4-latch and one deadbolt mortise with unique anti-pick design and concealed high-security cylinder. Stand-alone lock is powered by 4 standard AA alkaline batteries. Low power consumption, high reliability and low maintenance costs help keep running costs low. Wireless System I Standalone Lock – No wiring required, and locks are linked together through keycard operation. Installation is simple and easy. The lock memorizes the latest 864 access records, which can be retrieved anytime. The lock’s auto-check function alerts users of abnormal operations and low batteries. The onboard clock can be used to control access of both guests and staff for certain periods. Top quality encryption cards are adopted to perform control functions and unlocking functions. Lost keycards can be invalidated and disabled by simple card operations on the lock. Accessories Include: Elevator Control, Energy Saver, Passage Lock, Bathroom Lock, Safe. 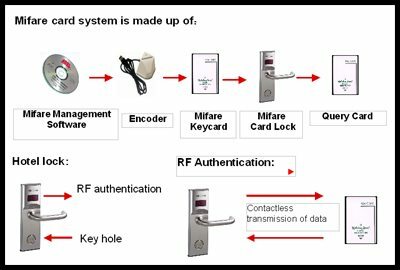 Keycards are grouped into 14 categories in a structure with 5 levels of clear defined access authority. 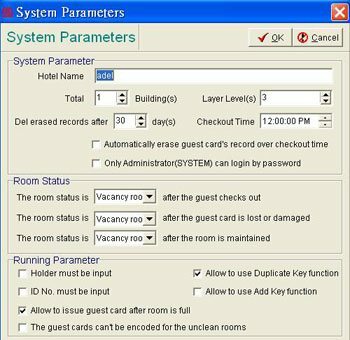 Hotel managers can modify card authority for each card according to actual needs. Operator-friendly operation interface including detailed hints for every operation. Detailed Stats Reporting querying the details for: issued cards and erased cards, room status and opening records. 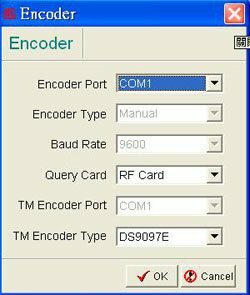 System parameter set up, encoder set up etc.